I know what you'll say. Another BMW...sheesh, you DT guys must have some kind of sponsorship from Bavaria. Not quite (although we'd love to get some kick back from BMW if you guys are reading this...send unmarked cash in brown paper envelopes care of the crazy cat lady down the street)..but if you can find another company that sells nicely styled manual transmission equipped sports sedans and V10 powered hoonmobiles, I'll become a fan boy for that OE too. Deal? Anyway, BMW M division's first bruiser sedan was the 1988 BMW M5; they had previously dabbled in the M1 supercar and 4-cylinder powered E30 M3 but it was the E28 M5 that set the standard for a fast M-sedan. 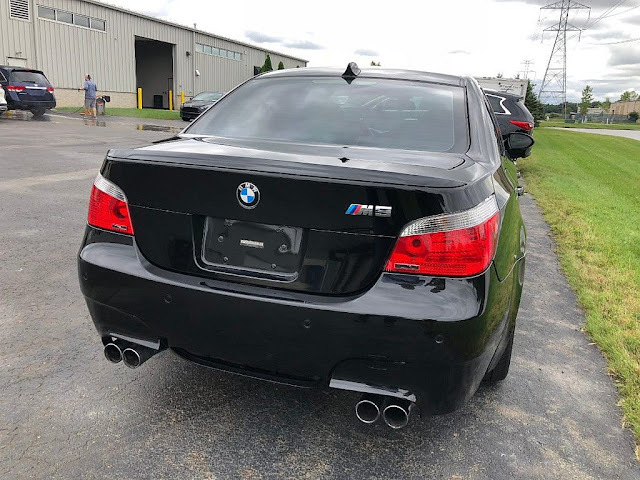 Multiple generations later that formula had outgrown its inline-6 roots and by the E60 generation the M5 was powered by an F1 inspired V10 with a screaming high 8250 rpm redline. Today these M5s are out of factory warranty and can be purchased for less than a new Honda Accord. 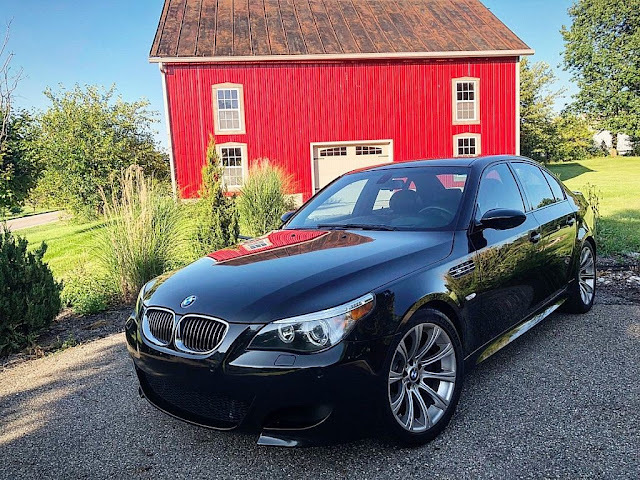 Find this 2006 BMW M5 E60 starting bid at $1000 with estimated value $17k here on SecondDaily.com. 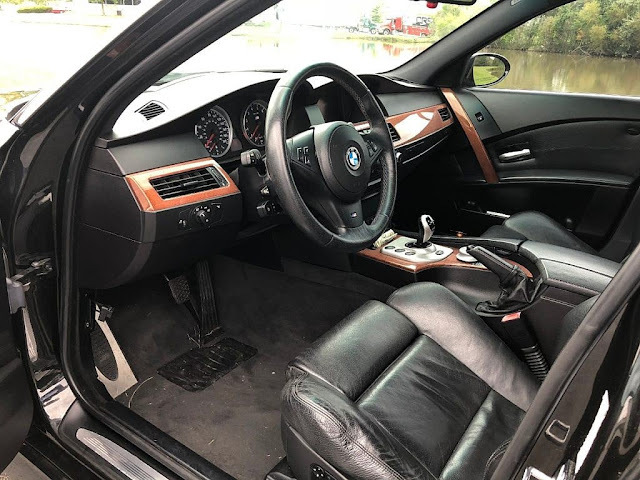 Second Daily is proud to present for auction this 2006 BMW M5, powered by that aforementioned 5L V10 paired with a 7-speed sequential manual gearbox (SMG). This is BMW’s auto-manual electronic/hydraulic shifter, allowing the driver to shift like a proper manual without the third pedal, rev matches and all. This M5 has seen just over 102k miles since new and has recently received extensive services to take care of some large price tag items that these cars may encounter. The seller reports it drives absolutely amazing, sounds amazing at high revs and the steering is laser sharp. It is currently stored indoors in a climate controlled facility. This one ships from Ohio with a clean clear title. Second Daily will cover up to $200 of the cost of a pre-purchase inspection (PPI) if you order one and then go on to purchase the car. So bid with confidence knowing we’ve got you covered. You must make arrangements prior to auction close and successfully win the auction to receive the $200 credit. Probably a very nice example. Every car I have checked out from this dealer has been very well taken care of, they know BMWs and find the best examples then take care of all the normal issues. I am amazed they are selling this one through second daily, they typically just throw a high price on their stuff and wait till they find the right person who is willing to pay for it. we have discussed with the seller for awhile about listing with us, he's a big enthusiast and likes what we are doing at SD so he gave us two cars to list (this one, and the XJS V12). 1) It's seriously Land Rover centric. I'm a Land Rover nut, and I've owned everything from RR Classics to D90's to Discoverys to P38's. With that said, it's a little too niche, and it's a niche that a lot of other people are currently serving---it's not hard at all to buy a nice 70's-90's Land Rover product right now. 2) There's a ton of reserve-not-mets currently, more of them than not I'd guess. It seems like there's a consistent gap that needs bridging between what their sellers expect versus their market reality. 3) C'mon guys....you can tell us the nearest major metro without sacrificing the seller's safety and privacy. Just listing the state is silly....if someone is in Philadelphia, they may very well have more interest and bid higher on a vehicle in Philly than in Pittsburgh. Not everyone pulls out the checkbook and finds a transport when they buy a 10-20k car. Just some constructive criticism since it looks like "Unknown" may be a party to the site...I seriously wish them well. These have grown on me. Not as classic styled as the E39, and the dash and doors looks goofy to me. But my M5 doesn't do 200 mph, have 7 speed semi-auto or a V10. Once these motors have the necessary updates and cared for correctly I believe they are pretty stout. Anybody have experience tracking/owning one of these vs an E39 M5?